1. What does a good construction logo look like? A logo is the first contact between your company and a potential client. A smart logo can make your brand look good and separate it from the rest. At the same time, an inappropriate logo can be very dangerous and make your business look ridiculous. What is an ideal construction company in the minds of its clients? It must certainly be reliable, stable, and responsible. A logo can help you form the right impression about your brand. This requires smart element arrangement and thorough selection of colors, fonts, and icons. 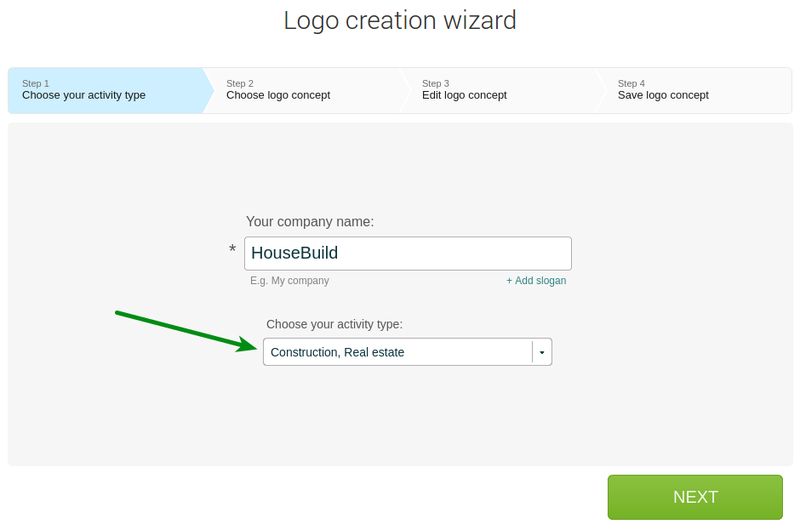 With the Logaster platform and some practical tips, you can make your construction logo in just a matter of minutes. The rest depends on you. use an online service (free or very cheap, you can adjust different parameters to craft unique logo solutions). As you can see, each option has its pros and cons. Not every businessman has drawing and designing skills, and design studios charge sky-high rates for their services. This is why using an online logo generator is the most suitable option. 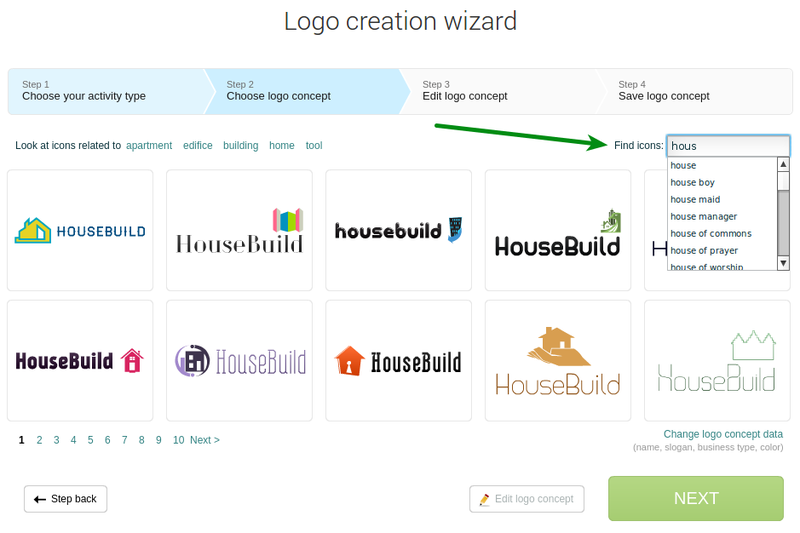 Below we’ll break down the method for creating a construction logo in Logaster. You probably know that certain images are associated with certain industries. The most straightforward associations with the construction industry include a crane, a brick wall, a multi-storey house, a man wearing a hard hat, and more. On the other hand, you run the risk of being generic. You can definitely do better. Take the time to analyze your competitors’ logos to avoid repetition. Let’s use Logaster to find construction-related images. First you need to select the “Construction, real estate” category. Logaster will display hundreds of relevant images. To specify your requirements, use keywords in either Russian or English. For example, you can enter “house,” “builder,” and other keywords. Keywords will speed up the search process and allow you to find the right icon for your business in no time. A successful color scheme can enhance your logo effectiveness, while inappropriate colors can drive customers away. With a smart color solution, you can put your potential clients in the right mood. For example, red is mostly associated with love, aggression, power, and energy. Other colors have their own connotations as well. When choosing a color for your logo, keep in mind the basic attributes that characterize your brand. What color scheme works best for a construction business? To build trust among potential clients, you need to communicate a serious approach, stability, and reliability. Consider using blue, red, brown, and green. Our instructions will help you make the right choice. 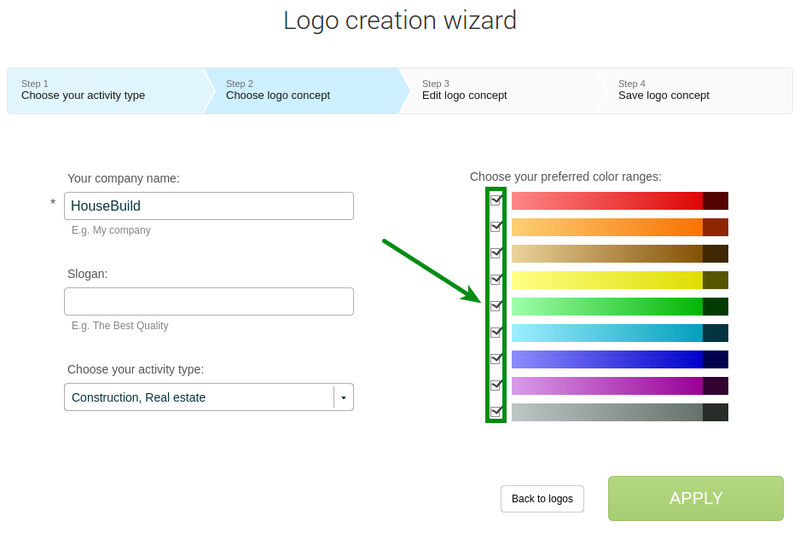 Avoid turning your logo into a rainbow by using multiple colors from different palettes. Find out what colors other construction businesses are using. With this information at hand, you’ll figure out what you need to do to separate your business from the competition. If you’re determined to use more than one color, kuler.adobe.com is just what you need to create the best color combination. Copy the HEX code of your selected color and insert it into the relevant field during editing. 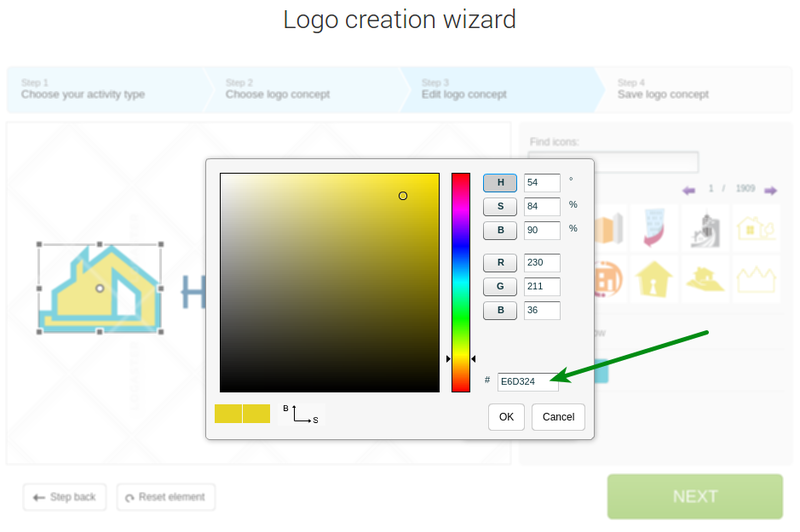 To select a color during the logo-making process, click on “Change parameters” in Step 2 and use a color filter. The best colors for a construction logo: blue, green, red, black, brown. Both font and color affect the way your logo is perceived and remembered. Furthermore, a font determines whether your text will be legible and whether a client will like the visual representation of your brand. There are multiple guidelines for making the right choice (see our article on the topic). Below we’ll focus on the main tips for construction businesses. Along with looking good, your text must stay legible across different formats, including a website header, social media pages, business card, badge, etc. Opt for a solid font to match a massive icon. Stay away from hard-to-read fonts with excessive scrolls and serifs, as well as fancy hand-written fonts. Straight and clean fonts (Europe, Garamond, MagistralC, etc.) are your best choice. You can change your logo font during editing. Logaster fonts for the construction industry: AA Haymaker, Ageone Serif, Micra, Souvenir, MagistralC, Europe, Garamond, After Disaster, Ubahn. increase or reduce distances between objects. 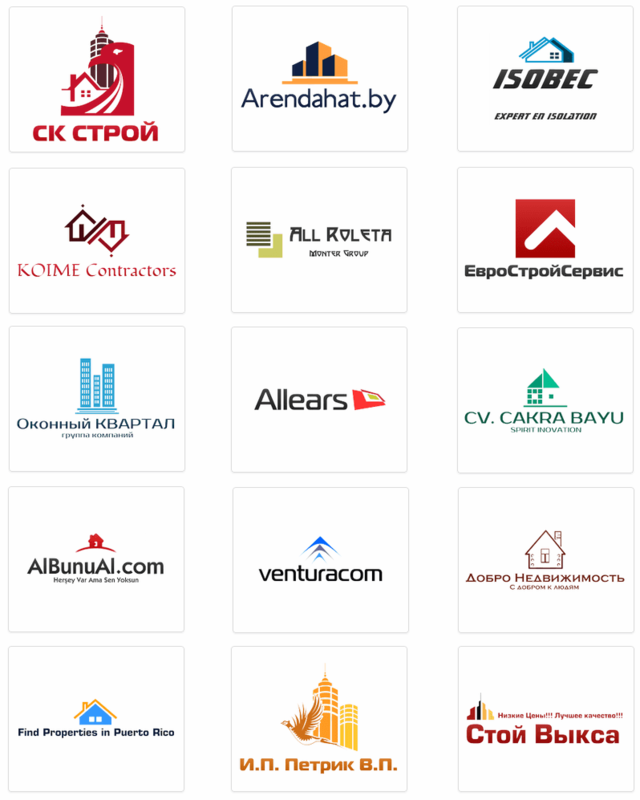 To wrap it up, we have prepared recommendations to help you create a neat and smart construction logo. 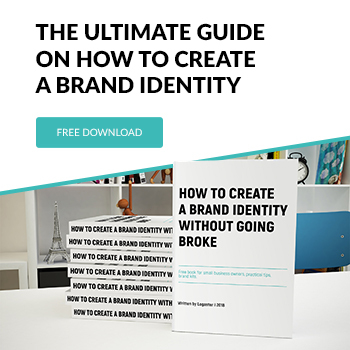 An icon and a concise message (or simply your company name) are usually more than enough. Do not put several images of construction materials (tools) and full contact information on your logo. This will make your logo look messy. Opt for just one font. If needed, use two matching fonts, tops. Excessive fonts may undermine your logo effectiveness and legibility. If you think one-color logos are dull, incorporate 2-4 matching colors and shades. Do not try to fill up all blank space with graphical objects and text. Leave enough space between and around the elements. Your logo will look good across different products, including business cards and other printing materials. Your logo is what separates your brand from the rest. Imitating existing ideas will hardly lead you to success. Learn from the experience of successful companies, analyze their logo solutions, and make your own logo even better. Be sure to create your logo in vector format. This will allow you to scale your logo without loss of quality and to place it on different products, from business cards to banners. As you can see, the recipe for a successful logo is pretty simple. Mix some imagination, an understanding of your final goal, and common sense. Add the Logaster online service. That’s it. You’ll have a smart logo for your construction business without a heavy investment of time and money. For more construction logo examples, check out our gallery. We hope that you have found our recommendations helpful. Try to create your own logo right now. Submit your company name in the field below – and Logaster will offer you multiple logos in a matter of seconds.